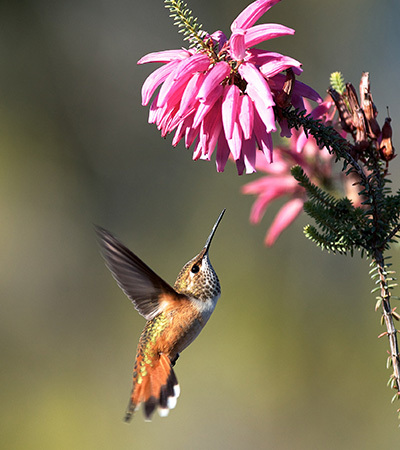 The UC Santa Cruz Arboretum will hold its annual Hummingbird Days, a family-oriented educational event celebrating nature's vibrant aerial acrobats, on Saturday and Sunday, March 5 and 6 (rain or shine!). The event includes a variety of activities for children and adults. A complete schedule is available online at the Arboretum web site. Admission is $10 for the general public, $5 for Arboretum members, and free for UCSC students and children under 17. Hours are 10 a.m. to 4 p.m. each day. During the event, nature lovers of all ages will experience and learn about hummingbirds and the particular flowers at the Arboretum that host and support them. 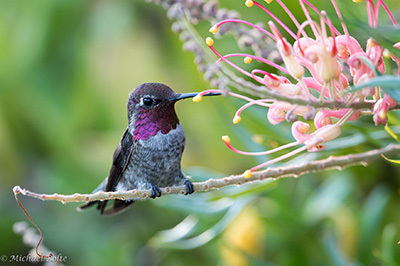 Visitors will have plenty of opportunities to see and hear hummingbird courtship and shenanigans, as well as to participate in a variety of activities focused on these amazing creatures. ﻿Activities for children include art projects, children's bird walks, and face painting. 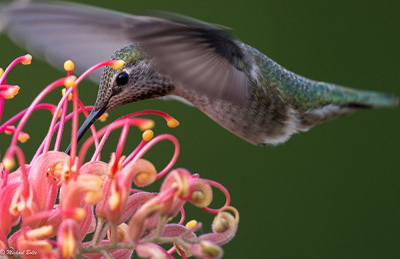 There will be talks on hummingbird natural history and gardening to attract hummingbirds; a hummingbird photography workshop (reservation and additional fee required); and guided tours of the gardens and their bird life. Tours in Spanish will be offered both days at 2 and 3 p.m. This year's program will also include a special "Breakfast with the Birds" event on Saturday for Arboretum members only, featuring Todd Newberry, professor emeritus of ecology and evolutionary biology and author of The Ardent Birder. Norrie's Gift and Garden Shop, open daily from 10 a.m. to 4 p.m., will feature event souvenirs, books, unique gifts, and plants that attract hummingbirds, as well as a wide array of drought-tolerant plants, gardening guides, jewelry, scarves, and home items. Sponsors for Hummingbird Days include Jane McKenzie, financial advisor; Allterra Solar; Bailey Properties; Bay Federal Credit Union; and Cindy and Ron Sekkel.